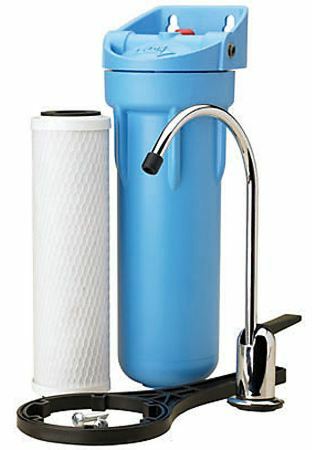 Omni Filters CBF1 Under Sink Drinking Water Filters & Purification Systems! Model CBF1 uses the leading carbon block technology to filter Giardia and Cryptosporidium cysts from your drinking water. The carbon block filter cartridge is also great at removing chlorine and odors so you get great tasting water from a dedicated faucet right in the sink. Each box contains installation hardware, a long-reach dedicated faucet, pressure release valve, wrench, mounting bracket, saddle valve, and a CB1 filter cartridge. Change tank O-ring with every second filter cartridge change. CB1 filter cartridge, K4 O-ring and OW30 Wrench. Change tank O-ring with every 3rd filter cartridge change. This unit uses integrated quick connect fittings for 1/4" plastic water tube. If you need connections or fittings for 3/8" tubing, order below, call or chat. comes with CB1 filter cartridge. Due to California Law, we are unable to sell California residents the Omnifilter CBF3. Purchase Replacement Cartridge singles or multi-packs.